"There was no question of where to make the drop-off -- at the center of the exhibit, beneath a large black-and-white photo of Julia in chef's apron and wild seventies polyester shirt, one hip cocked, grinning. There was even a narrow shelf running along under it, as if it really was a shrine, and pilgrims really were expected to leave their offerings there." 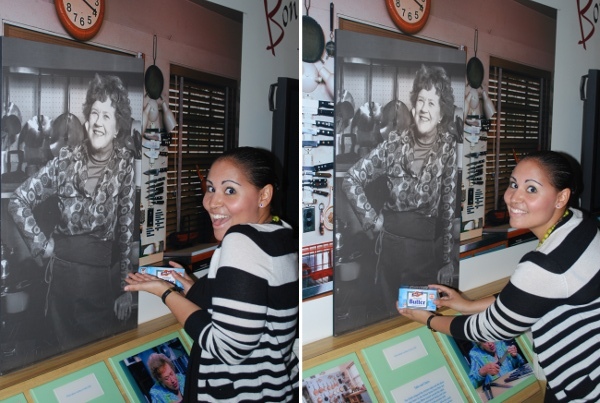 I caused a bit of a ruckus at the Smithsonian National Museum of American History the other day. Those of you who have seen or read Julie & Julia will probably understand why. The brilliant idea struck me late on Friday night as we were packing for our weekend getaway. My friend Lindsay had invited us down to the city and was throwing a dinner party in our honor. Even though we were coming in from five states away, I certainly wasn't about to show up empty-handed so I promised that I would bring a homemade dessert. I chose Molly's "Winning Hearts and Minds Cake" as it's an easy (but amazing) chocolate cake that actually tastes better on the second day. That night, in the midst of the packing and scrambling that usually occurs before a trip, I popped into the kitchen to stir up the copious eggs and butter and chocolate that basically constitute the entirety of that recipe. Once the cake was in the oven, I noticed the now-empty box of butter. "I'm bringing this to Washington!" I announced, running into the living room with the butter box in my hands. 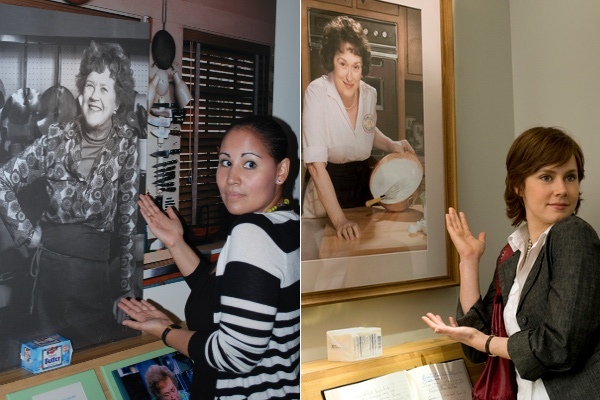 "And we can go to the Museum of American History and I can recreate that scene from Julie & Julia where Julie takes the awkward picture with the butter!" I ran to the computer to Google image search "Julie Powell Butter Smithsonian" while Eugene gave me that look that he gives me when it's already midnight and we have to get up in 4 hours and instead of packing I'm Googling things about food. The picture came up and I dragged the laptop over to my mirror so that I could practice mimicking Amy-as-Julie's awkward pose. "This is going to be great!" I told him, while I dismantled the box to keep it from getting crushed in transit. I think by this point, Eugene was just glad I wasn't bringing actual butter to DC with us. We actually didn't make it to the museum until our last day in Washington (although that wording implies the scheduling wasn't intentional...which it absolutely was). We started at the Air & Space Museum (long been my favorite of the Smithsonians) and then walked across the National Mall to American History. It was only once we were inside that I realized I'd completely forgotten to bring along tape to put my butter box back together again. As soon as we got past security, I dragged Eugene to the gift shop in search of "some gum or something sticky" that I could use to seal the box. Unfortunately, there were no gum or stickers or tape of any kind anywhere in the store. I started to despair until no other than Julia Child came to my rescue. Near the back of the store there was a display of Julia Child cookbooks. I turned one over and realized that the sticky price tag on the back of the book would be perfect. With Eugene blocking me from view, I slowly pulled off the price sticker off the book and ran out of the store. In the main hall I ripped the sticker in half and used it to tape the box back into shape. We were now ready for phase two of our mission. 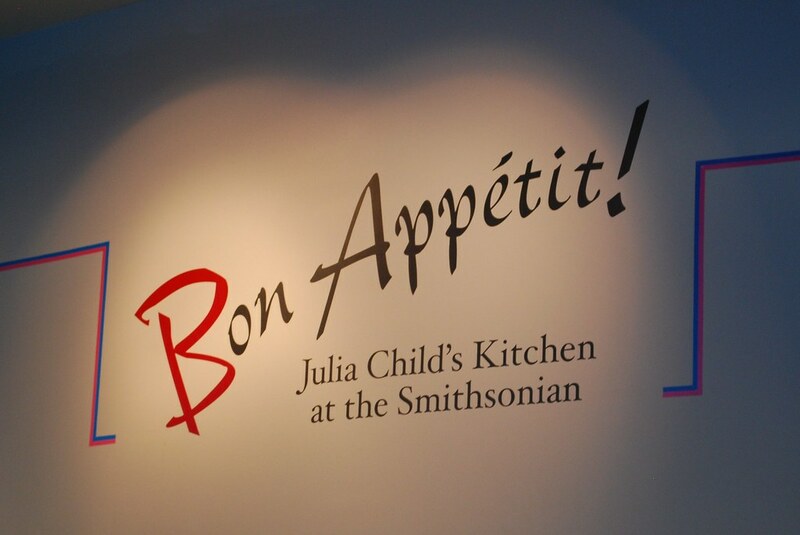 The Julia Child exhibit at the Smithsonian has always been a popular one, but even more so since the movie opened. The exhibit was teeming with tourists taking pictures and watching the Julia videos playing on a constant loop on a TV screen near the front. I suddenly started getting a little nervous that my plan wasn't going to be as easy as I imagined. We walked around trying to find the exact spot in the movie where Amy Adams/Julie Powell left the butter, but it quickly became apparent that the movie had lied. There was no neat little corner with a guest book and framed portrait of Julia. The location from the movie didn't exist in real life. "Hollywood lied!" I hissed at Eugene as we realized that we weren't going to be able to recreate the scene. Disappointed, I pushed past the throngs of people and pressed my face up against the plastic window looking into Julia's kitchen. It was smaller than I remembered, but really lovely. All the elements where there: the beautiful peg board with Paul's outlines, the pictures of cats, the gorgeous copper pots. Close to the window, there was a memo pad and Julia's phone with little bits of tape stuck to it. I looked at it closely and realized something remarkable! On the speed dial pad, next to some names I didn't recognize, there was a button clearly marked "Dorie. G."
By this point it was pretty clear that we weren't going to get the photo I'd wanted. Just as we were ready to move on to the next exhibit, a group of people watching the videos cleared out and, like a glorious mirage, Julia appeared. "Oh my God!" 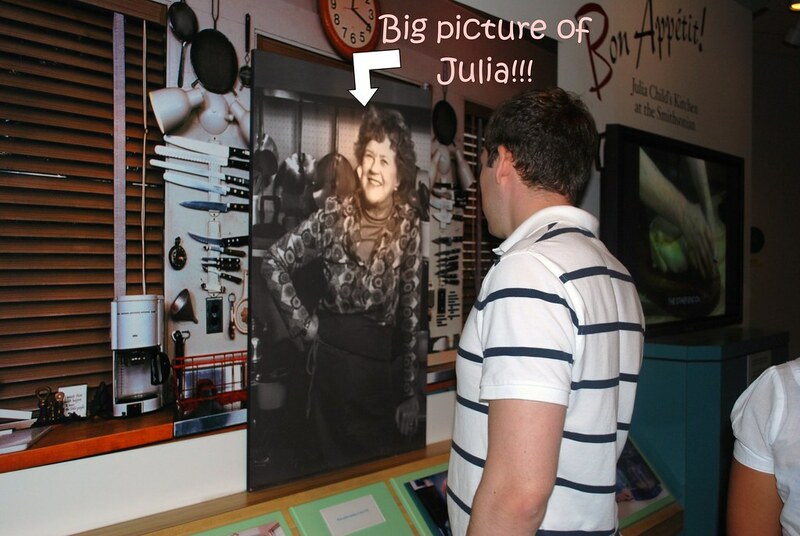 I called Eugene over and pointed out the large photo of Julia in a crazy polyester shirt and apron. "It's a picture! I can do it here!" Beneath the portrait, just like in the book, there was a little ledge. The perfect spot for my butter. I gave Eugene the camera and walked over to the spot. There were still a lot of people around so I had to summon up my nerves, but I did it. I pulled the butter out of my bag and placed it on the ledge while Eugene snapped away. I did my best to recreate the awkward pose from memory: one hand straight, one hand towards the photo, chin scrunched into my shoulder. While I was posing, people suddenly started to recognize what I was doing. I kept hearing them whisper "butter" and "Julie & Julia." "You brought your own butter!" One man finally said to me when I finished with the shoot. "Did you see the movie? 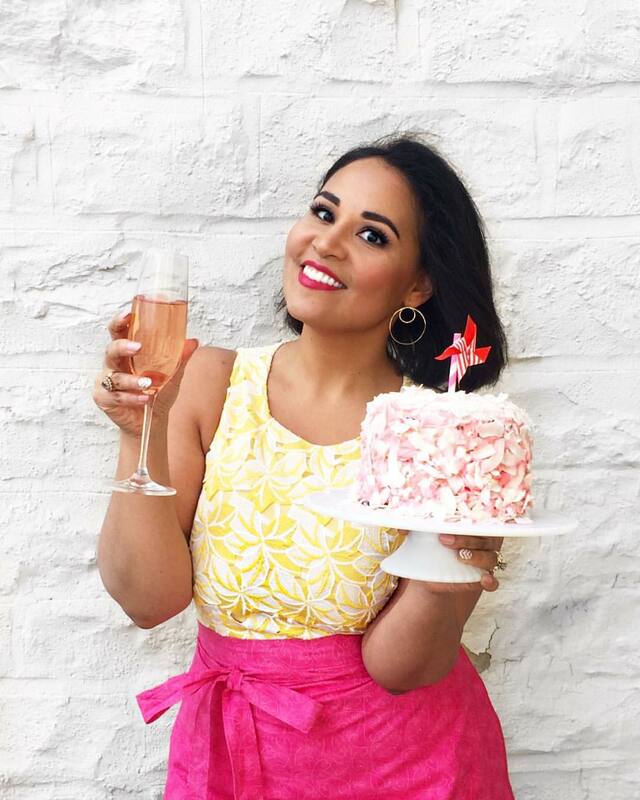 I'm a food blogger. I'm trying to recreate the scene," I explained hastily. He laughed appreciatively, noting that he loved the movie, and I gave him my business card so he could check the site out later. A mini crowd had gathered by this point so I told them all about the blog and handed out a few more cards. Eugene turned to me after the crowd moved on. "Are you satisfied now?" he asked. "Oh yes!" I said, and took his hand as we headed over to the next exhibit. Back in New York the next day, I pulled out my copy of the book and flipped to the end where Julie makes her pilgrimage to Washington. I laughed because her description of the moment was actually a lot like what I experienced. And from her words, there is no doubt that the picture I saw was the same one she took her photo with. The movie may have lied, but ultimately my recreation of it ended up being a lot closer to the original than I'd imagined. OMG, you're hilarious! You go, girl! 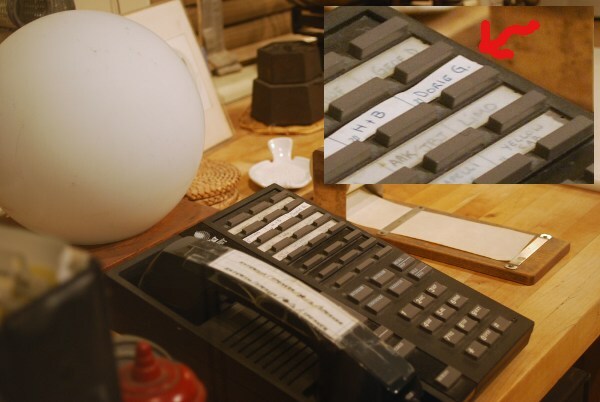 On that phone, I believe AAK/JBJ would be Alfred A Knopf (publisher) and Judith B Jones (Julia's editor). I really want to go there! Haha so funny you put the butter there, just like Julie! this is awesome :) I want to go so bad! Chaz: you're absolutely correct! AAK/JBJ would definitely be knopf and Judith Jones. So cool! Wonderful! You are so clever! Awww so cute! And considerate of the museum staff to use a box instead of the actual butter (though I'm sure it wouldn't be much fun to carry a pound of butter around yourself...melty butter isn't a fun purse accessory). Love the discovery of Dorie on speed dial too! HA! I'd say you did quite well, and, in fact, I'm so glad to know you only used a box of butter and not a box filled with butter! Fun to read this story! Oh, I love your story... and the excitement and passion you shared even with your sweet and patient husband. he he What we do for love, eh? How precious! Love the recreation : ).